The purpose of a 360-degree feedback review is to clarify areas in which an employee is excelling, as well as areas in which improvement is needed. 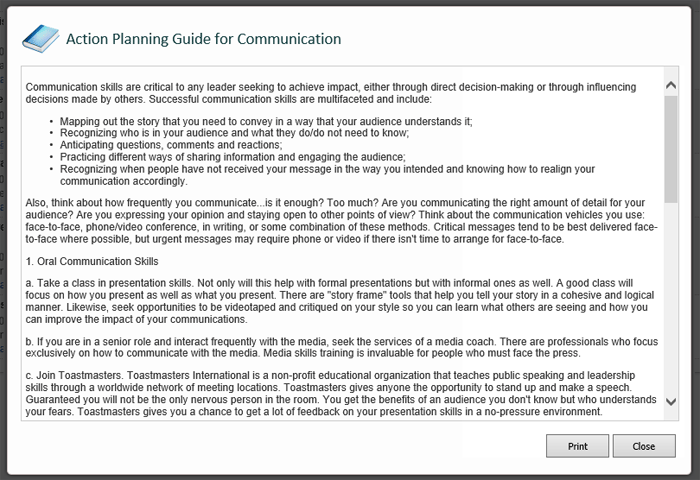 This process is greatly enhanced when a manager, coach or consultant actively engages the employee in a conversation about their results immediately following the review, and accompanying this debrief with a tangible, yet flexible development planning tool that allows agreed upon goals to be set, monitored, and updated over a period of time. It assists the employee in understanding his or her feedback and identifying themes in the ratings and comments received. Helps the employee prioritize behavioral areas that require development. Provides structured time with an employee's manager or coach focused on creating an actionable development plan. If using the EchoSpan Development Planning Module, create a draft development plan for the employee to review during this meeting. A debriefing meeting ultimately helps the employee see that the feedback they have received, even if perceived as negative, is being directed to a positive, constructive outcome. It's usually best to present the feedback report to the employee a day prior to the meeting or at the meeting. This is so that any conclusions that the employee reaches by reading it can be addressed quickly. If the employee hasn't read their review report already, let them do so. Sit quietly while they digest the information it contains. Once the employee has read the report, ask what their reactions are. Once you let him/her process their reactions, and have expressed empathy for what he/she may be feeling, then move on to the content. Ask what they think the underlying themes are. These may or may not line up with your pre-identified strengths and developmental opportunities. If both of your observations align, this is a good time to begin the discussion on development planning. If you disagree on the key observations in the report, discuss them and try to work toward a common agreement on areas for improvement. Once you and your employee have reached a mutual understanding of the key strengths and developmental opportunities outlined by the report, it's time to craft a development plan around them. In this plan, we recommend focusing on no more than three strengths and three development opportunities. This helps ensure employees do not get overwhelmed by trying to set too many goals that they ultimately cannot achieve in the designated timeframe. The creation of this plan is most easily done by using an automated tool such as EchoSpan's Development Planning Module. Because it's fully integrated with the EchoSpan 360-degree feedback system, it can automatically identify key strengths and weaknesses, as well as recommend developmental reading and actions based on review results. It also allows the employee to structure the development plan around a standardized framework, so his or her efforts are directed and quantifiable. It's important to track progress on the development plan regularly. 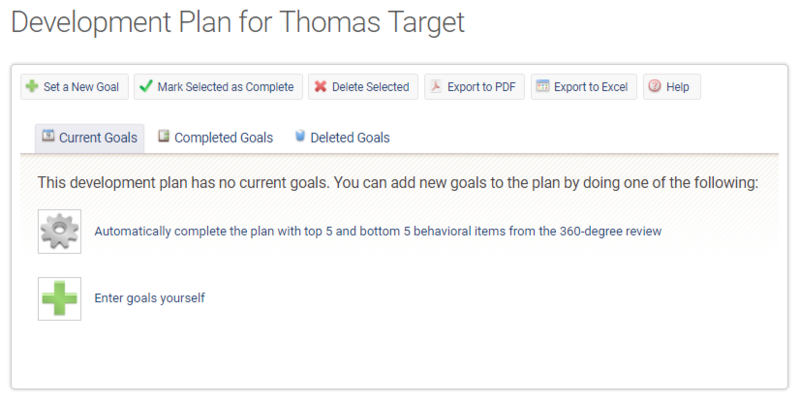 Using the EchoSpan Development Planning Module, you are able to create automated reminders as each development plan item reaches its stated milestones. 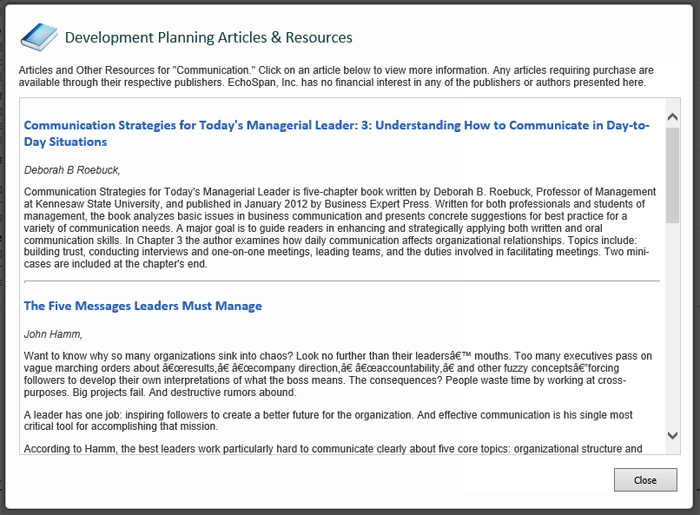 EchoSpan's development planning module is easy to use and requires no additional training for your Participants. Each competency has an action guide that helps the Target craft their objectives and solicit feedback from observers who participated in the initial 360-degree feedback process. Click here to learn more about the tool features.